Relax after a long day in this cozy recliner. A sturdy seat, bustle back and soft gray performance fabric create a comfy experience for you. 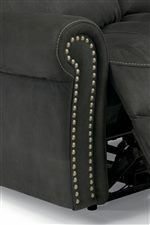 Elegantly rolled arms, nail head trim and exposed seams add unique character to the piece. While sitting in this chair, you can glide or recline with just the push of a button. You can also charge your devices with the built in USB charging station. The Daniel Cozy Power Glider Recliner with Nail Head Trim by Flexsteel at Crowley Furniture & Mattress in the Kansas City Area: Liberty and Lee's Summit, MO & Overland Park, KS area. Product availability may vary. Contact us for the most current availability on this product.